Several months ago I attended Write on the Sound, and blogged about writer’s conferences. It was a nice conference and I had some panels that I learned from, like the ones by Priscilla Long and Ron Gompertz. I came away with a little new knowledge, a couple new resources, but not enough that I thought it worth the cost of the conference, the hotel, the gas. Last week I escaped to a small writer’s retreat, joining authors Susan Schreyer and Kaylan Doyle. We got up early and spent the day writing. While we worked on our own projects, we were in the same vicinity. There was little noise as we delved into our story worlds. Every so often one of us would get stuck, would ask permission to break the writing. And then there would be a few minutes of a different sort of productivity as we helped each other figure out what was going on, brainstormed solutions, read a piece of work, received feedback. And then the silence would fall again. I have never done something like that. Writing in a group setting never appealed to me, let alone talking about my work in progress before the first draft was finished. So what made the difference this time? Well, first off, my writing routine has changed dramatically over the past two years. From writing at night to writing in the morning. From writing to music to writing to silence. But more than that, I think it was the safe environment. I was in the company of two writers who, while all three of us have different ways we write, were trusted. If something wasn’t working, I knew they would give me honest feedback that I could take away and use or not. And there was absolutely zero pressure to produce or to share. Several times I’d glance up to see one or the other staring out the windows, lost in their work, even though fingers were still. In the early evening, we took a break, went for a walk, went out to dinner. Then we came back, the tea kettle and coffee pot went on, chocolate came out, we sat around the table and talked writing and swapped tales. And then drifted back to our writing. I have learned that I can write in the presence of other writers, I can share a work in progress (at least snippets), and that I got way more value from this retreat than I did from the conference. I’ve also learned that I need to do this again. It pays to stretch out our fingers, take a deep breath, and allow our writing to try something new. 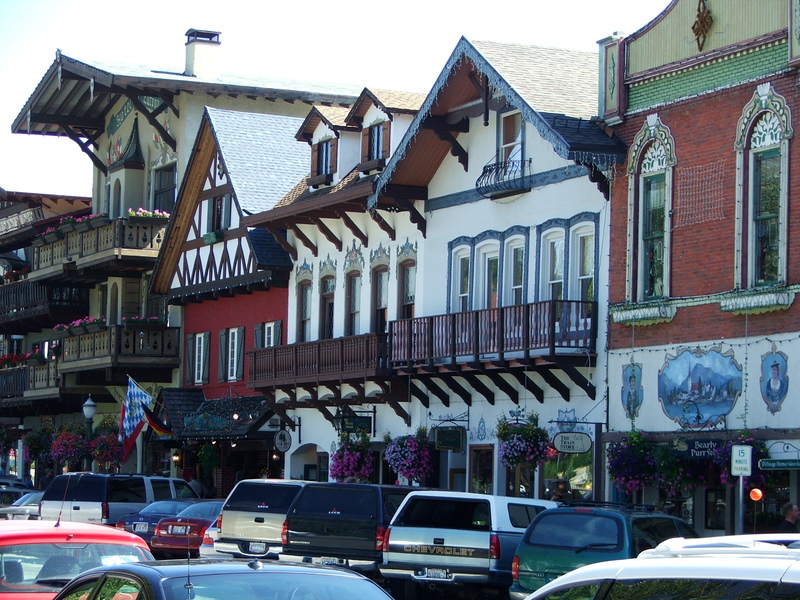 Below is a photo of Leavenworth, WA, where we wrote. . This sounds like heaven to me. I used to take writing retreats alone, to a shabby beachside b & b but haven’t for a long time. I miss it. What a wonderful thing to have writer-friends to accompany. What a gift! It’s definitely something I need to repeat, even if it’s just for a single day. I have done the ‘alone’ retreats and they are invaluable, too. This joint one was a first for me though, and I was amazed how easy it was.